Info "‘I am Wari-ogre and I’m the prince of the Sunland! Use the sacred sword to fend off attacks.’"
Not the Face! is one of Tiny Wario's Microgames in WarioWare: Smooth Moves. 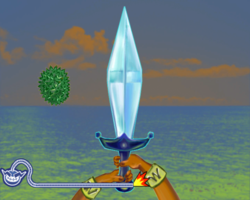 The player must defend against the projectile(s) as Wari-ogre by swinging the Wii Remote either left or right to ward off the projectile(s). One of the projectiles includes Wario noses. 1st level difficulty: One projectile. 2nd level difficulty: Two projectiles. 3rd level difficulty: Three projectiles. This page was last edited on February 20, 2018, at 17:57.